Gwen Strahle (Senior Critic, Experimental and Foundation Studies) is showing new paintings at Oresman Gallery (22 Elm Street, Northampton, MA), Smith College. Strahle paints objects and still-life’s from observation and from memory. Her new body of work explores color and light through the eye of the water glass, and through her memory of gemstones. She utilizes them to conjure two different ways of experiencing the luminosity of objects. The gems remain singular while the water glasses radiate into the larger still-life. Both approaches seek out treasure in their context. Gwen has exhibited in galleries and museums across the country. 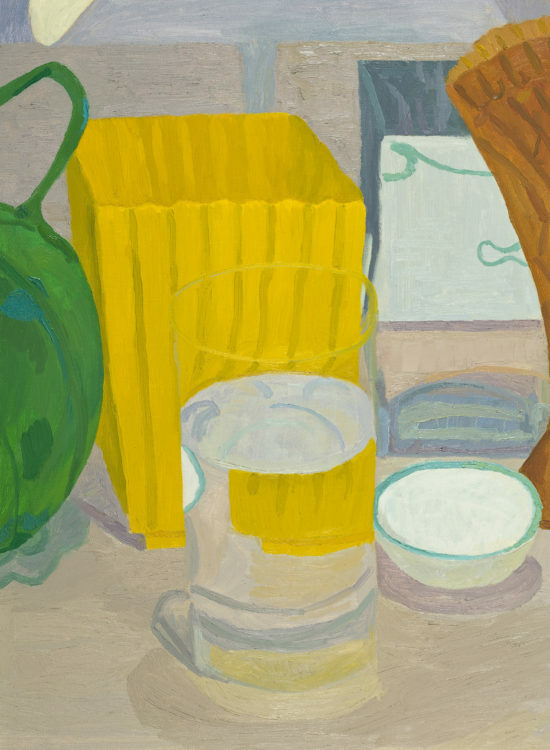 She shows her paintings with Zeuxis, an association of still-life painters. She is the recipient of awards from the Connecticut Artist Fellowship, the Guggenheim Fellowship, the American Academy of Arts and Letters, and the Ingram Merrill Foundation. She holds a BA from Rhode Island College and an MFA from Yale School of Art. She lives and paints in Northeast Connecticut, and has been teaching at the Rhode Island School of Design since 1984.